The last issue of the Goat Gazette, “Caprine Arthritis Encephalitis Part One: What is CAE?” included an explanation of what Caprine Arthritis Encephalitis (CAE) is, how it impacts production, and how it is spread. Part Two will discuss steps producers can take to prevent and control the disease in your herd. Preventing or eliminating CAE from your herd relies on three main control points: kid management, herd-wide testing, and culling or isolating infected animals. Contact between kids and infected dams is thought to be the main cause of disease transmission. While there is no evidence that CAE can spread from the doe to the kid in utero, preventing kids from drinking CAE infected milk or colostrum after birth is essential. If a CAE infected doe is about to kid, you should plan to be present at the birth. This allows you to immediately remove the kids from the maternity pen and place them in a clean, well bedded kid pen, separate from any infected goats. Ideally, kids should be housed in a separate barn or room that does not share ventilation with adult or infected animals. Preventing does from licking the kid(s) and nursing may help reduce disease spread. If you can’t be present at birth, talk to your herd veterinarian about taping the teats of prospective dams. Kids should be fed heat-treated colostrum that is low risk for CAE or colostrum replacer. For more information on feeding colostrum, see Ontario Goat’s “Colostrum Management for Commercial Goat Production.” Following colostrum feeding, kids should be fed pasteurized milk (from healthy does that were not treated with antibiotics) or milk replacer. Once you have separated your kids from CAE infected adults, be sure to never mix them with goats of an unknown health status or CAE positive goats, even once they are mature. It is important to remember that testing for CAE is only useful if you plan to follow these best management practices to reduce the transmission of CAE within your herd. If goats that are low risk for CAE are allowed to mix with CAE positive goats, then your kidding management will have been for naught. 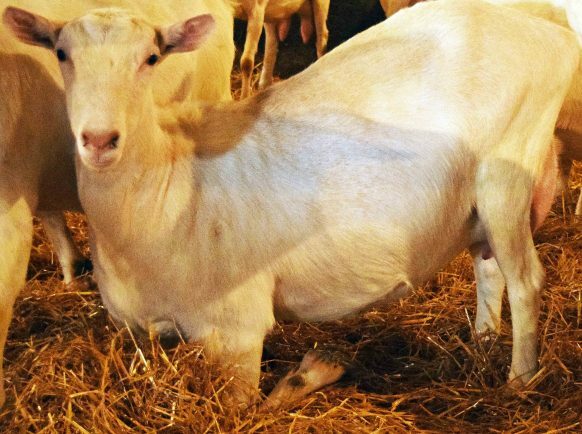 It is highly recommended that CAE positive goats be culled upon discovery, but some producers may object to this for economic reasons, choosing to keep the goat in the herd until symptoms develop. In this case, two herds should be established. The herds should be kept as far apart as possible (a minimum of 10 feet separation) although it’s much safer if there is no sharing of air space at all, which means at least one wall is solid, non-porous and cleanable. Water sources, feed and equipment used to deliver it, needles, syringes, disbudding equipment, hooftrimmers, and tattooing equipment should not be shared between the herds. If this is not possible they must be properly disinfected between groups. Workers moving between the herds need to wear disposable coveralls, gloves, and boots or have specific clothes and footwear to wear while working with each herd. For more information on isolation of goats, see Ontario Goat’s “Best Management Practices for Commercial Goat Production”. The recommended testing protocol for your farm should be established in conjunction with your herd veterinarian and based on several factors such as housing, level of infection, and current and proposed management. Testing involves collecting blood samples and sending them to a laboratory. For example, Ontario Goat’s GoGen project’s CAE testing protocol includes testing kids at four to six months, eight to ten months, and after 12 months of age but before kidding. This allows producers to make breeding and kidding management decisions based on the results of the tests. After a doe has kidded, testing semi-annually is ideal. Your herd veterinarian can help you determine the right testing schedule for your herd. A common mistake in CAE control programs is focusing only on does and forgetting about bucks. Typical buck behaviours such as spitting, drooling and urination are common ways to transmit the virus. The safest policy is to use virgin bucks that are low risk for CAE every year. If you wish to preserve the genetics, bucks should be tested at least every six months. Unfortunately, a negative blood test for CAE does not mean the goat is not infected, as the levels of the virus in the blood stream can fluctuate over time. As such, a history of several negative blood tests as is required to be reasonably sure that a goat is considered low risk for CAE.